The Utopian World Championship was created by SOC.Stockholm, which was a Swedish artist group with seven members, that all appear in the photo above. 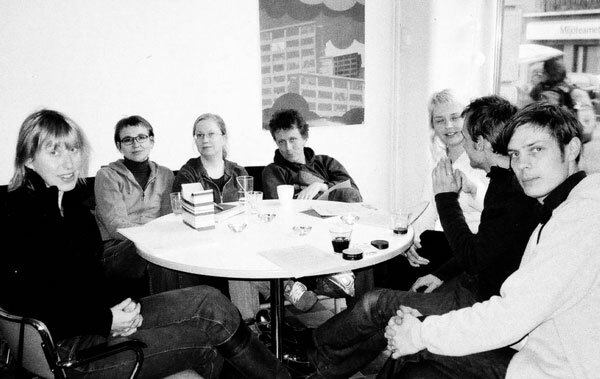 From left to right: Karin Willén, Annika Drougge, Anna-Lena Lundmark, Johan Malmström, Pernilla Carlsson, Jon Brunberg and Tobias Sjödin. The group existed between 1999 and 2005 and had its base in an old shopfront store in central Stockholm, which served as its working space and public venue. SOC.Stockholm ceased to exist as a group in 2006, and Annika Drougge and Jon Brunberg continues to manage the project since. Contact Jon Brunberg for all inquiries about the Utopian W.C.